I love automation. If you’ve been following this blog, you’ll know I’ve written a few times about using continuous integration to automate the deployment of your software. Why stop at deployment? Can we use automation to improve our infrastructure? The answer, unsurprisingly, is yes (this would be a pretty short article otherwise.) There are many different tools out there that can be used to automate the provisioning of hosting infrastructure. In this article, I will show you how to automatically provision a static site hosting environment on AWS with CloudFormation. Automating deployment is an easy sell: it’s not uncommon for software to be deployed many times a day, so the time spent setting up the automation is easily earned back over the life of the project. Spinning up a webserver, on the other hand, may only be done once for the life of a project, and figuring out how to automate this process may take longer than just manually setting up the server. However, automating these processes provides much more than saving time. Any process that is performed by a human being is prone to error. Performing this process via script will ensure things are done the same way every time. Additionally, defining your infrastructure via a configuration file or any sort of script is a way of documenting what your infrastructure needs are. Particularly when using a cloud provider like AWS with its myriad services, it can become easy to lose track of which resources your project is dependent on. Encapsulating your infrastructure in code makes it easy to see see at-a-glance what resources are used by your project. Finally, should you need to de-provision your infrastructure, a tool like CloudFormation can do that automatically. You won’t have to worry about paying for orphaned resources that are no longer being used. AWS’ CloudFormation service manages stacks of services. To create a new stack, you can use one of their sample templates or upload your own. AWS also has a CloudFormation Designer Interface that helps you to create your template visually, as well as a tool called CloudFormer that lets you create a template from your existing AWS resources. For our purposes, we’re going to write a configuration file from scratch. CloudFormation accepts both JSON and YAML files. We’ll be using YAML in our example, as I find it slightly easier to write, and we can embed comments into our configuration to improve the self-documenting nature of our template. The Parameters section is where you define the user-defined values in your template. Using parameters will make your template more reusable. When a user creates a new CloudFormation stack from your template, the CloudFormation UI will provide fields for them to fill out these parameters. Resources is the meat of your template: that’s where you define which AWS resources should be created when this Template is run through CloudFormation. Finally, Outputs is where you define the information that should be provided to the user after the resources are created, for example when third-party services need to be configured to operate with your AWS infrastructure. A CloudFront Distribution to handle requests to our website and retrieve the pages from our S3 Bucket. CloudFront is AWS’ CDN service. It is possible to serve a website directly from S3 without CloudFront, but this is not recommended by AWS. Accessing and caching the requests through CloudFront will generally be cheaper than serving them directly from S3. In fact, we will be configuring a Bucket Policy and a CloudFront Origin Access Identity to ensure that only CloudFront can read from our Bucket, and that it isn’t exposed to the general public. Let’s start by defining the Parameters we want to include with our template. 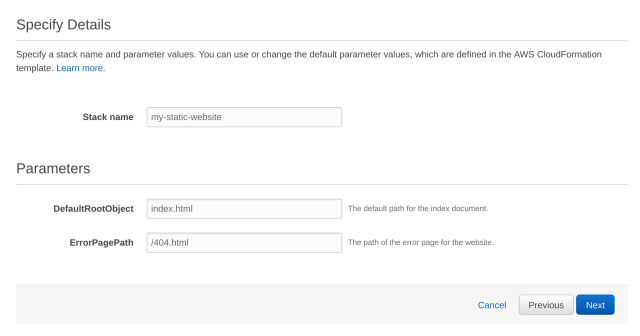 This template will take two parameters that will be used in configuring our CloudFront Distribution: the path to the default root document, and the path to the error page. The default root document will be displayed when somebody visits the homepage, and the error page will be displayed when a user requests a page that could not be found. The Type attribute of our resource tells AWS what kind of resource we are provisioning. The property name (in this case, S3Bucket,) can be anything you want — this name is used to reference the resource and may also be used when automatically generating resource identifiers. Specifying a new resource with a Type of AWS::S3::Bucket is all we need to have AWS create a new bucket with a unique identifier. We can reference this bucket elsewhere in our template using the !Ref and !Sub functions, just like with our parameters. As mentioned before, we won’t be exposing our bucket contents directly to the general public: we want all requests to be handled by our CloudFront distribution. To make this work, we are going to create a CloudFront Origin Access Identity. This identity is how we will grant the CloudFront Distribution access to our S3 Bucket. In addition to Type, a resource will also contain Properties. This is how you configure the resource, and each resource will have different properties. The best way to determine how to configure a resource is in the Resource Types Reference in the AWS CloudFormation documentation. Our Origin Access Identity is a sort of token, and it doesn’t need much configuration. We are required to add this Comment field to it, but the comment doesn’t need to be anything in particular. I’ve included the name of the S3 Bucket (using the !Ref function) so we know what this identity is being used for. This policy is applied to our bucket and grants read access to the Origin Access Identity we just created. Note we’re using another function, !GetAtt, to retrieve nested attributes from our CloudFrontOriginAccessIdentity resource. The CloudFormation resource documentation tells us which values can be retrieved from a resource in its Return Values section. This is where we use those ErrorPagePath and DefaultRootObject parameters. Under Origins, our S3 Bucket and Origin Access Identity come together to make our distribution work. Be sure to check out the full template on GitHub to see the DefaultCacheBehavior configuration - it has been excluded here for brevity. CloudFront’s DefaultRootObject only applies to requests to the homepage, not subpages. If your website uses “pretty URLs” (leaving off the /index.html by default,) the DefaultRootObject configuration is not enough. We will explore ways to solve this using CloudFormation in a future post. The four resources we’ve created so far — the Bucket, BucketPolicy, CloudFrontOriginAccessIdentity, and CloudFrontDistribution — are all we need for a basic static site hosting environment on AWS. We can then upload files to the bucket, and they can be access from our CloudFront URL. The directly-attached policy will allow all operations on the bucket. The AccessKey will give us programmatic access to the bucket. However, after an access key is created, we can’t fetch the secret from the AWS IAM interface. This is where CloudFormation’s Outputs come in handy. The third major component of a CloudFormation template is the Outputs section. This is where we can retrieve information from the resources we created and display them for the user. Outputs have a Description and a Value, and just like in the rest of our template we can use functions like !Ref, !Sub, and !GetAtt to pull values out of our resources. Once again, the Resource Types Reference should be used to determine how to extract the desired values from your resources. Now, when we create a new stack with our template, the user will see these values in the Outputs section after the template finishes running. Our tutorial today covered the basics of creating a static site hosting environment with CloudFormation, but it leaves a few things to be desired. Next time, we’ll improve our template using Route53 to hook up a domain name to our CloudFront Distribution, Certificate Manager to make our site available over HTTPS, and a Lambda@Edge function to make “pretty” URLs work. Hopefully, this post has helped you to see the potential of a tool like CloudFormation. 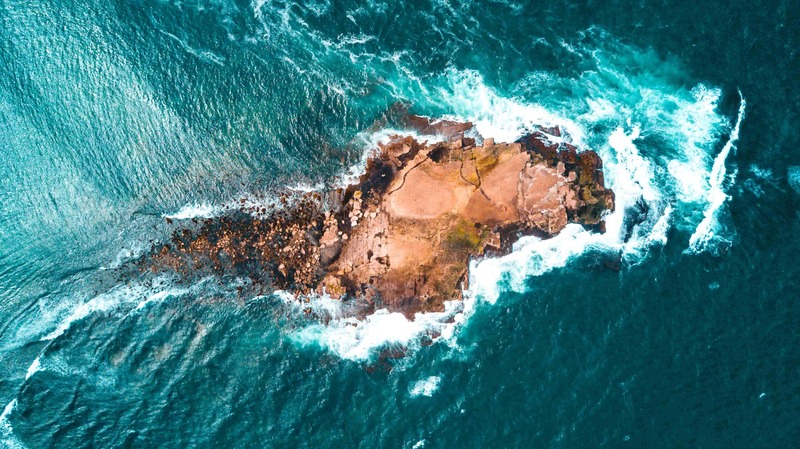 The next time you need to set up a hosting environment for your static site, consider expressing your infrastructure as code with CloudFormation! Next week: We'll improve our CloudFormation template to easily create a static site hosting setup. Last week: We gave you some tips on creating in-app documentation in Forestry.